As sweet as cinnamon: Craftsy Giveaway! Craftsy... have you seen or heard of it. and a place to chat and learn all things craft. Once you have joined in you can browse and join in the fun. cake decoartion classes...everything for the crafter. 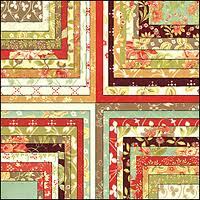 I'm thinking of making these fabrics...Tapestry by Fig Tree Fabrics..
Quilt-As-You-Go....that's a bonus I think. Do you want to make one as well? Spread the word I am having a Giveaway! or if your new to the Craftsy community thats ok too! You must use the link if you want to enter the GIVEAWAY.. Giveaway ends 25th July 2013.... be sure to enter. Now of to cut some fabric and watch the Tutorial. Oh wow! I can't believe I haven't gone over there before now! Thank you! I would so love to try this class. I have been wanting to try making some bags for a while now but just not had the courage! that is a wonderful give-away. I visit Craftsy everyday. It is such a great site for so many diffrent crafts. Wow, what a great sounding site. I will definitely go and join up.